If you use the Reminders app on the Mac, you may wish to print out a reminders list, maybe it’s a grocery list or a checklist of things you need to do. Curiously, the Reminders app for Mac does not include the ability to print, however. 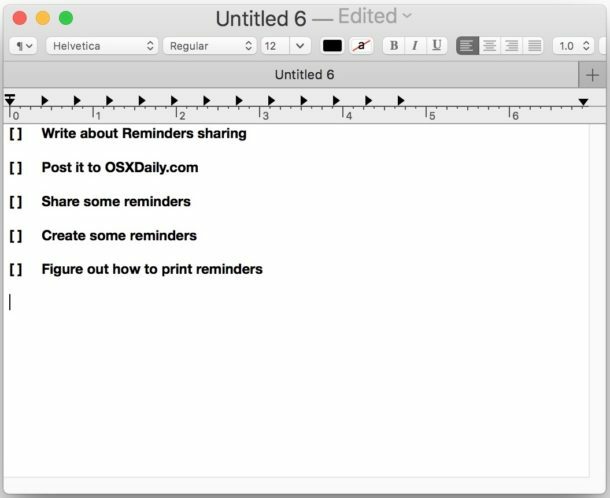 So how do you print a reminders list from a Mac or reminders in iCloud? 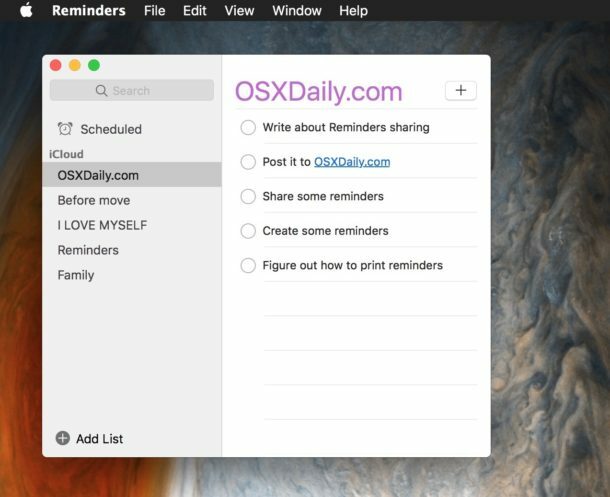 This guide will show you how to print reminders lists from a Mac, this is using a workaround method that offers perhaps the simplest way to print out reminders in MacOS. 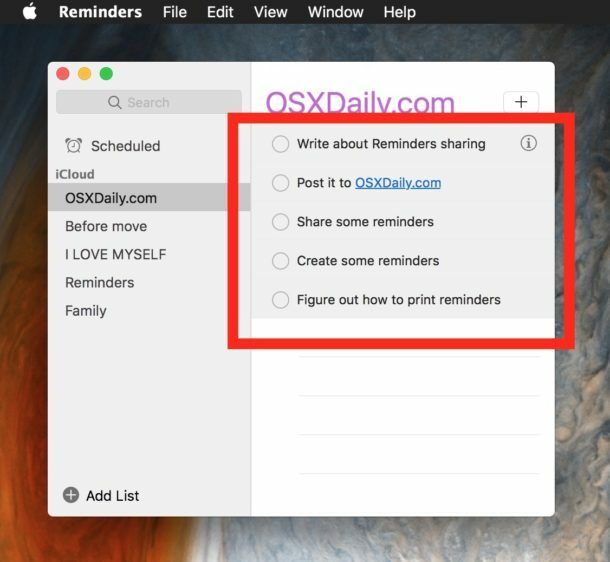 You can use this method to print any reminders list whether it’s on the Mac or whether the reminders are synced to the Mac over iCloud from an iPhone or iPad does not matter. 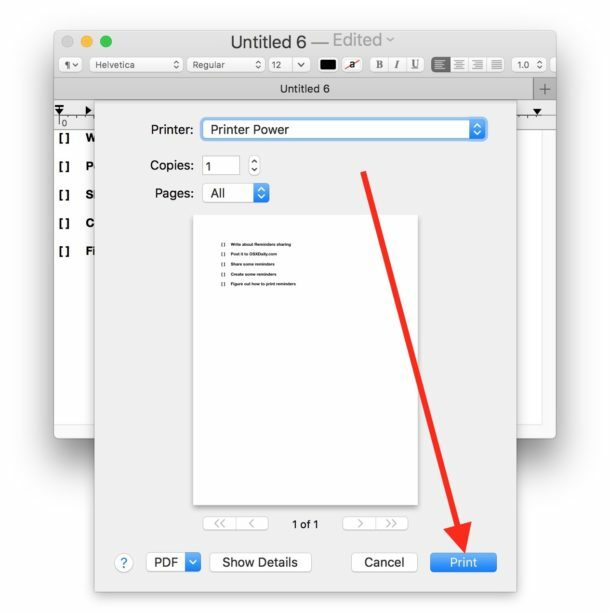 That’s it, the reminders list will now print, or you can choose to print as a PDF if desired. This is helpful for obvious reasons, whether it’s to print out a grocery list, a general to-do list (remember you can add to Reminders with Siri for locations, what you’re looking at on screen, and much more), a task list or items list, or so much more. Once the reminders are printed out you can always delete them from the Mac, but note if they’re synced via iCloud then you will find they’ll also be removed from an iPhone or iPad too – and vice versa of course, if you delete all reminders lists on an iPhone or iPad using iCloud to sync them then those corresponding reminders will also be lost from the Mac. 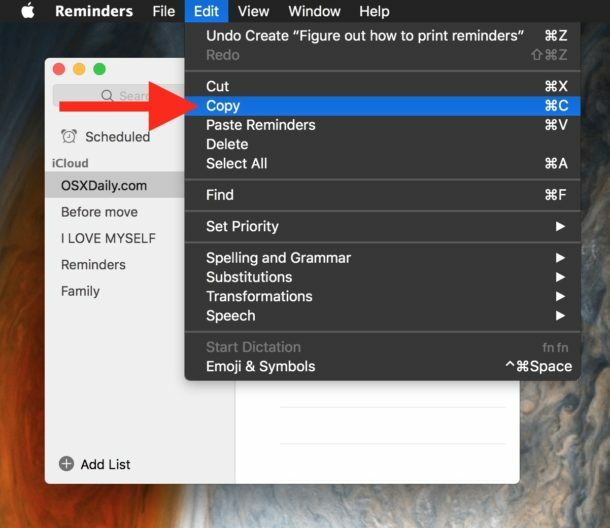 And yes, in case you were wondering, at the moment in order to print a reminders list on the Mac, you must copy the reminders list and then paste it into another app that supports printing. 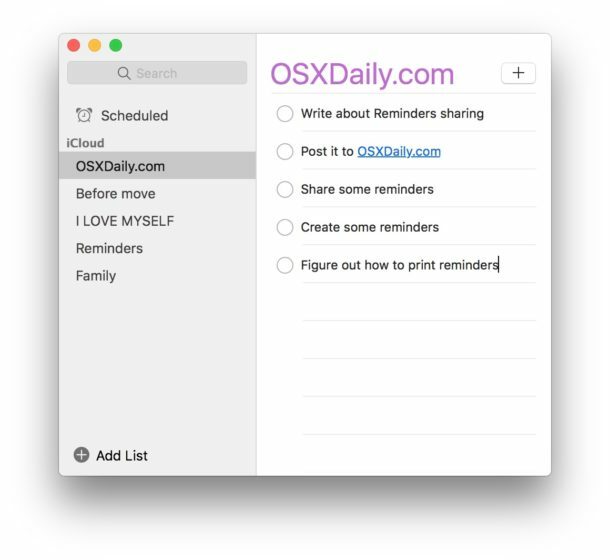 Why the Reminders app in Mac OS and Mac OS X does not support printing is a bit of a mystery, but perhaps future versions of the reminders application for Mac will gain the printing ability without using copy and paste. Can you print Reminders lists from the iPhone or iPad? Currently there is no way to print reminders lists from the iOS Reminders app either. 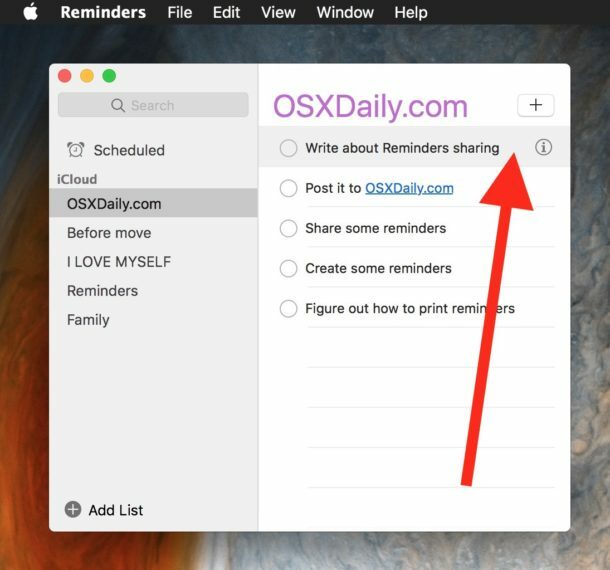 Thus if you want to print a reminder from an iPhone or iPad, you may want to just search for it in iOS, share it with yourself or a Mac user, then use the directions above to print the reminders list from the Mac. Perhaps a future version of Reminders for iOS will also gain the printing feature. 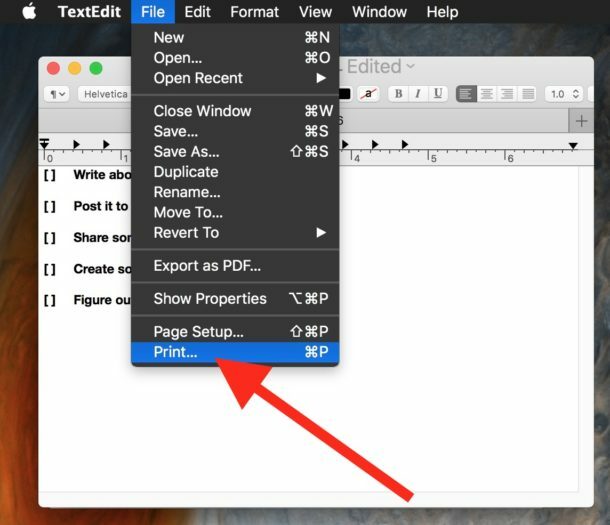 Know of another trick to print out reminders from Mac OS or iOS? Let us know in the comments! You can take a screen shot of Reminders, save it to Desktop (or any other place), and then open and print it. For a company with the slogan: “It just works,” sometimes it doesn’t. How difficult would it be for an Apple engineer to allow printing directly from the Reminders app? It’s really ridiculous that that facility isn’t there. Another example: when you copy a URL and paste it to an email or text document, you usually have to go through a couple of more steps to make it a clickable link. Windows has made pasted links clickable automatically forever. And, why can’t you just delete a file from Finder by highlighting it and clicking the delete key? Why do you have to go to a dropdown menu and find and click Trash to delete files? Even if you inadvertently deleted a file you wanted to keep, it could still be in the Trash folder as it is now. But you can delete files from Finder with Command+Delete keystroke combination, it will send the selected file(s) to the Trash on the Mac. I guess the next question is: why you need to use two keystrokes when one should be enough? Does clicking just the Delete key do something else in Finder? If the file goes to Trash accidentally by clicking only the Delete, it can easily be recovered if it was deleted by mistake. Why not just select and then use Control P to print selection? Sorry … that should have been Command P not Control P.
Because you can’t. Check to see for yourself. FYI here’s the complicated way I’ve done it. I have a $7/year subscription to Anylist, which (a) provides with subscriptions a Mac app that auto-syncs and (b) optionally copies over list items from Reminders. So I import a Reminders folder into Anylist (first creating an identically-named file in that app) and once it transfers I can print it either from the iOS or Mac app. Yes, a kludge, but an automated one! I’m unable to select an item in any list by “clicking just to the right of the item.” Each list item has an empty circle on its left side that can be selected, but that does not allow a “Select All” action to select all items in the list. It really just allows me to Edit that item. Same here! Can not do select all. Quicker and easier to simple press cmd/shift/4 and get a screen grab and print it! Great post. Thank you for the information. One question, hope you can answer. What about the notes sometimes attached to the reminders; do you know of a work-around to print those? I just figured out a workaround that might work in other calendaring and reminder systems. Bill David’s comment above triggered the idea. I opened Fantastical (I remembered that it not only integrates with iCal but also with Reminders); Went to “View” in the toolbar and selected “Reminders”, voila! All my reminders color-coded and sorted appropriately. 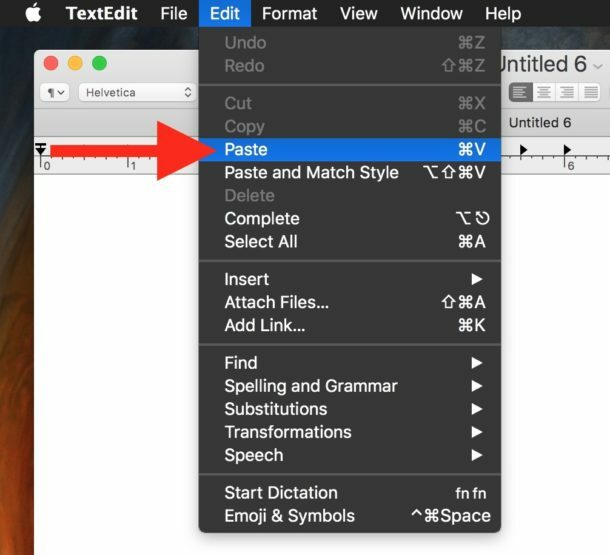 Right-Click, copy, paste into my text editor Scrivener.